TS Siddipet Conduction of Science Month Celebrations - Registrations and Inspire Nominations Orientation to Science & EVS teachers list Scheduled Dates as per Rc.No:TSSA/BWAMO/ 2018-2019/TS Siddipet Conduction of Science Month Celebrations - Registrations and Inspire Nominations Orientation to Science & EVS teachers as per Rc.No:TSSA/BWAMO/ 2018-2019. TS Siddipet Conduction of Science Month Celebrations - Registrations and Inspire Nominations Orientation to Science & EVS teachers as per Rc.No.TSSA/BWAMO/ 2018-19 Date: 24-7-2018. All the Mandal Educational Officers, are hereby informed that a half day orientation at Conducting Science Festival Celebrations and uploading the school data pertaining to Inspire Registrations and Nominations for inspire awards to all Science teachers and Primary EVS teachers working in the district as per the Schedule given below. 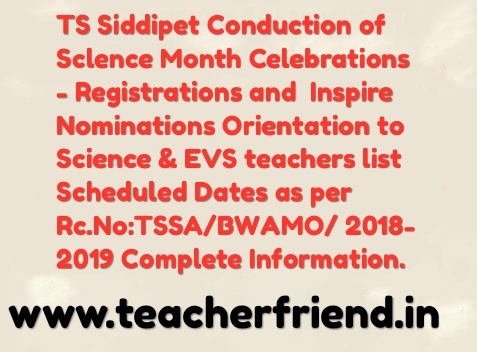 TS Siddipet Conduction of Science Month Celebrations - Registrations and Inspire Nominations Orientation to Science & EVS teachers list Scheduled Dates as per Rc.No:TSSA/BWAMO/ 2018-2019. 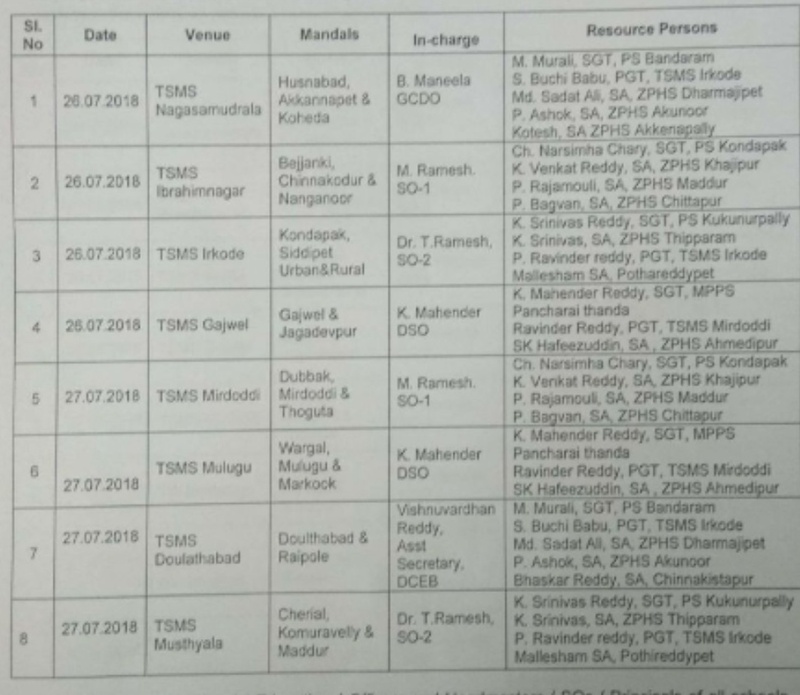 All the Mandal Educational Officers and Headmasters / SOs/ Principals of all schools are requested to relieve the teachers concerned to attend the training programme as per the schedule District Educational Officer & Ex- Officio DPO, TSSA Siddipet District. Note Approved by the District Collector, Siddipet dated: 25 05.2018.